Ultima Furniture started over 30 years ago in the garage of CEO Alf Ellis, who decided to build his own kitchen. Last year, their DIY kitchens beat IKEA in the quality test of British consumer magazine “Which”. 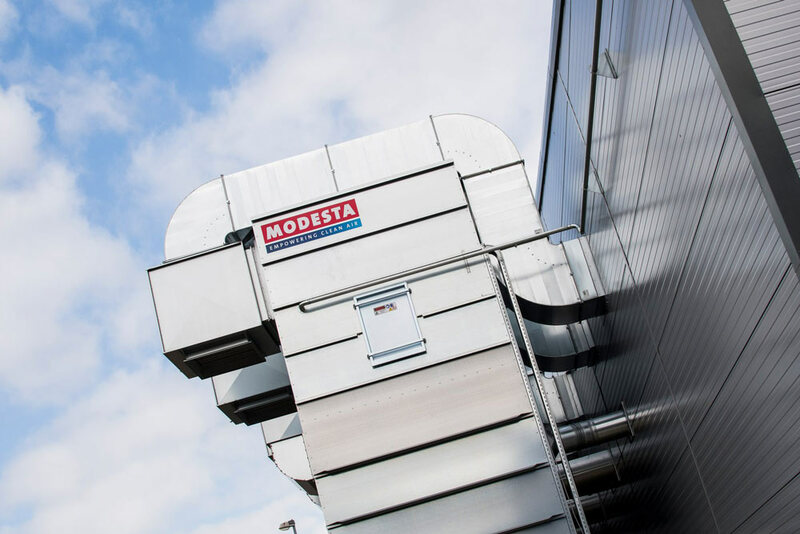 Since their acquisition of a new building in 2010, they’ve been keeping their factories clean with Modesta filters. We meet CEO Alf Ellis in his office in South Kirby to talk about his company’s most important milestones, the technology he uses in his fully automated factory and the collaboration with Modesta. Ultima Furniture designs and crafts complete kitchens, manufacturing everything in-house and producing on average 3000 cabinets a week in one of their plants. Next to their brand Ultima Furniture, they own DIY-kitchens.com and Innova Kitchens. Ultima’s products are made to order and supplied with all parts fitted to prevent visible fixings and holes. This way, their customers can design the kitchen they want exactly. Furthermore, Ultima’s state-of-the-art automated machinery ensures high efficiency rates and affordable prices. In 1983, Alf and his wife Clare bought a new home but struggled to find a good, affordable kitchen that they liked. Alf: “I decided to build my own kitchen in the garage – not knowing this would be the first ever Ultima product.” After building a kitchen for a friend of his sister’s and using the money to buy more equipment, he decided to open their first business premises. Ultima began to attract multiple trade customers and after several big investments and upgrades to bigger plants, they’re now operating from several units, capable of producing more than 9500 cabinets a week. Their automated cabinet assembly line is the most advanced in the UK, automatically inserting hinge plates, worktop brackets, different types of drawer runners and leg bosses. Starting out as a family business, Alf still works together with his wife, son, and daughter. Nowadays, he prefers to be involved in business development and logistics. His children focus mainly on the online presence of Ultima and the use of new technologies to manufacture their products. Next to the Ellis family, Ultima has around 310 employees. When Ultima Furniture was looking to move their kitchen door, accessory and painting production to a new unit in 2010, they acquired the first Modesta filter. Alf: “The technology of their machines is fantastic: they’re energy saving and have a quick installation and repair service.” The modular set-up of the filter systems ensures energy efficiency: thanks to the use of several smaller motors as opposed to one big one, the customer can arrange the desired output without performing out of the motor’s ideal range. Should a defect of one of the fans occur, the rest of the fans can keep running and production is not interrupted. If this happens, a self-managing team of mechanics makes sure the system is fully operative again without any downtime for the production.